A fascinating story from a legendary character, Jack Heuer retraces his exceptional career in the Swiss watchmaking industry. The story begins in 1860. 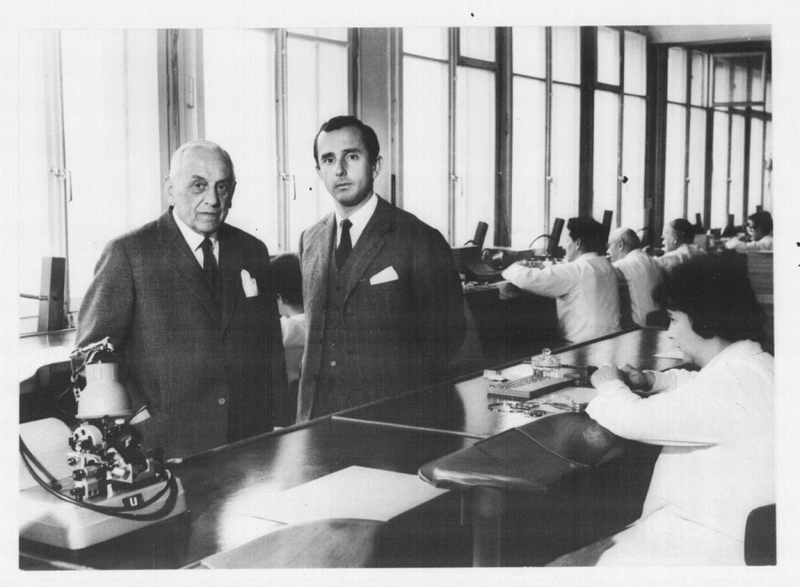 Jack W. Heuer is the great-grandson of Edouard Heuer, who in that year founded a small watchmaking workshop in Saint Imier called “Ed. Heuer & Co”. One hundred and fifty-four years later, the spiritual father of TAG Heuer and Honorary Chairman of the Swiss brand reveals his secrets in an autobiography entitled The Times of My Life. 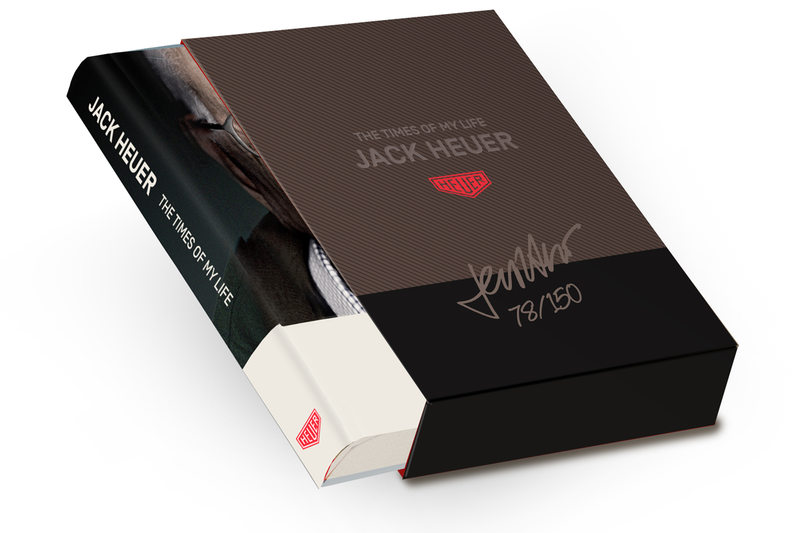 Before you would rush to Amazon, this is a limited edition book of only 150 copies. 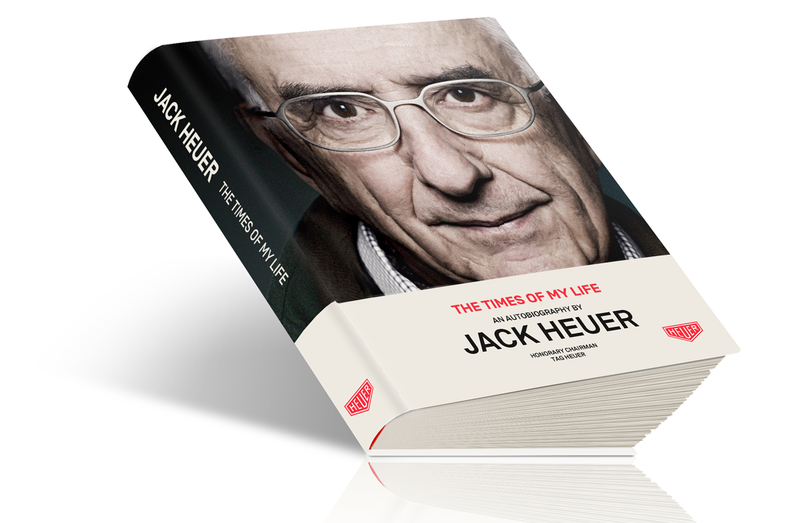 The selected few, who will have the chance to read this book, throughout its ten chapters and 290 pages, will get an intimate perspective on the life of a daring pioneer, the stories of the development of timeless collections, such as the Carrera, the Aquaracer or the Monaco, F1 and everything else that made TAG Heuer what it is today. On hearing the name of the King of Cool connected with stopwatches my ears went up like flick knives and I immediately sprang into action to get all this equipment ready and crated for shipping to France. However, since these watches and timing devices had not technically been sold it would have taken me too long to get the export papers required for what would in effect be just a “temporary import”. I instructed our driver simply not to declare them at the border when crossing into France. The driver, Gerd-Rüdiger Lang, had asked to work for us to improve his knowledge of watchmaking in general and chronographs in particular. He was a very nice and talented person and I was planning to send him to our US subsidiary on a temporary US visa. This had turned out to be impossible, since in our case these special US visas were issued only to Swiss citizens and Gerd-Rüdiger was German. Anyhow, I gave Gerd-Rüdiger cash for his travelling expenses and he set off for Le Mans in his own car loaded with our equipment. He was of course stopped at the French border and had to hand over most of his travelling expenses to pay customs duty and a fine. But he arrived safely on time on the film set in Le Mans and delivered all the props to Don Nunley. He also got to meet Steve McQueen and returned safely to Bienne. About 10 days later I received another phone-call from Don Nunley who said: “Jack, this time I’ve even better news for you. We’ve finished the trial shots and will start shooting for real tomorrow. Steve McQueen is going to wear one of your “Monaco” wrist chronographs and will also wear the Heuer logo on his overalls. But I have a problem: what shall I do with the watches when shooting is over in about three weeks’ time?“ Delighted with this good news, I thought for a moment and had nightmare visions of the customs hassle if we attempted to bring back the watches we had “smuggled” into France. I told Don he could give the watches away as gifts. As I was not present at the moment when Steve McQueen chose to wear a Heuer “Monaco”, I have to draw on hearsay from Don Nunley and Derek Bell, the British racing driver who also took part in the filming. The film company had hired two professional racing car drivers to coach McQueen to drive the unbelievably-fast Porsche 917. One was Derek Bell and the other was Jo Siffert, who was under contract with us. McQueen and Siffert got on like a house on fire, perhaps because they had both started their lives in humble circumstances and had gone on to become superstars in their respective professions. The day before shooting was due to start, one of the film’s production executives, Robert Rosen, went up to Steve McQueen and said: “Steve, tomorrow we start shooting for real. So far you’ve worn several types of racing overalls but now you’ve got to settle on how you want to look.” Apparently McQueen pointed towards Jo Siffert and said he wanted to look exactly like him. Siffert then ran to his caravan to fetch one of his white racing overalls which had the Heuer logo on the heart side and handed it to McQueen. Then Don Nunley went up to McQueen and said: “Now you have to chose a watch – here’s a nice Omega!” Apparently McQueen then handed the Omega back to Nunley, saying: “Not an Omega, they might use my name”, and instead he chose a Heuer “Monaco”, never having heard of us. Don Nunley says he had to offer the “Monaco” because it was the only watch of which he had three identical models. He needed three because one model would be used in the live racing shots, one would be used in the still photography and one was needed as a spare in case the others got damaged. Furthermore, if Jo Siffert’s racing overalls were emblazoned with a Heuer logo, film continuity demanded that the driver should also sport a Heuer chronograph on his wrist! The film company was delighted with the watches and timing equipment Heuer had provided and invited me to visit the film set at Le Mans. I flew to Paris Orly where they had sent a twin-engine Beechcraft private plane to pick me up and fly me to Le Mans. There I was given a tour of the set but unfortunately did not meet Steve McQueen as he had a day off and was exploring the surrounding French countryside on a motorbike. I did, however, have lunch with the film crew and sat next to Elga Andersen, the beautiful German actress who played the leading female role in the film. A few days after returning from this visit I got another call from Don Nunley. This time he was in a panic because he had given away the watches to key members of the film crew and McQueen had noticed this and had flown into a rage, saying Nunley had misused his reputation. Nunley then got out of this argument by saying all the people had bought the watches at a special reduced price. He was going to send me a fax with the names of all those to whom he had given watches and also specify the type of watch. He asked us to make out invoices at token prices and to fax them to him immediately. We did exactly as Don had asked and in the following days checks for 30, 50, 70 etc. dollars trickled in from those members of the film crew who had bought our watches. Unfortunately it also meant Steve McQueen went away not too happy about this incident involving Don and our company (But see Chapter IX, “The 1996 public offering and the 1999 sale to LVMH”). 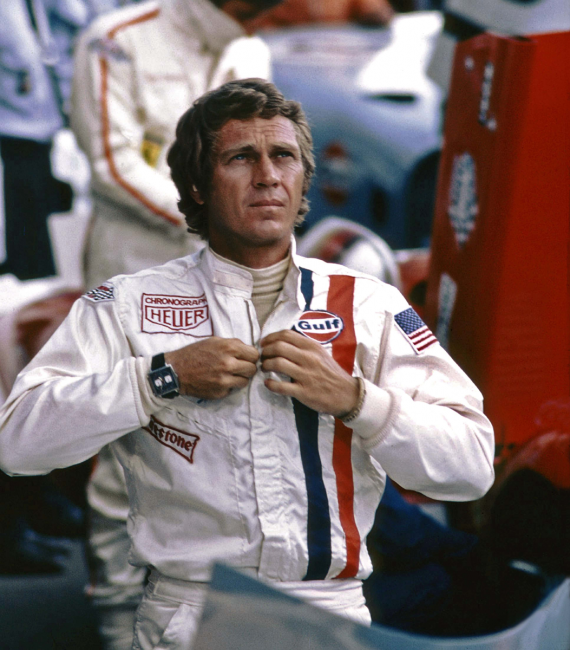 In July 2012 I was staggered to read that the “Monaco” watch worn by Steve McQueen for the still photography was sold at an auction of Hollywood memorabilia at a hammer price of USD 650,000. I believe this is the highest price ever paid for a Heuer timepiece!